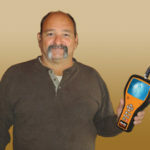 Plumbing pro Jake Albright likes reliability, ruggedness and convenience in his drain cleaning tools. That’s why the ultra-compact, handheld Gen-Eye Micro-Scope® video inspection system remains a key part of his equipment arsenal. The award-winning inspection tool from General Pipe Cleaners offers outstanding versatility when inspecting 1-1/2″ to 3″ drain lines, many toilet traps, and hard-to-reach places like duct work, furnaces and crawl spaces with the 39″ probe rod. “It quickly gets to the root of some problems – literally,” Albright adds. 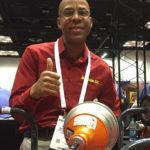 A Pittsburgh native, Albright started the successful Steel City Plumbing in 1982 before relocating to Florida and founded Naples Plumbing LLC in January, 2014. Now his burgeoning business serves a mix of commercial and residential customers throughout Collier County. One of them recently experienced a clogged toilet in their house. That’s when he grabbed his Gen-Eye Micro-Scope. Albright’s model “GM-G” Micro-Scope includes handheld command module, 3-foot probe rod and carrying case. It also sports an open reel with 100 feet of micro push-rod and color camera. The whole package weighs just 24 pounds. The Micro-Scope quickly discovered roots had penetrated the line, and they were successfully eliminated. “Without having to pull the toilet, the initial inspection was also a lot less expensive for the customer,” Albright notes. General’s trim Micro-Scope package literally puts inspection accuracy and convenience in the hands of plumbing and drain cleaning pros. The Micro-Scope monitor sports a bright, 3.5″ LCD screen and built-in SD card reader with one-touch record button to archive job photos or videos. In addition to a USB port, it also includes digital zoom, rotatable picture, voice-over recording and LED brightness controls. “Voice-over recording and videos really help explain what you’re doing for customers,” Albright observes. The monitor attaches to the reel with an adjustable mount for optimal viewing angles. 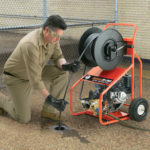 Depending on model, the reel can hold up to 100 feet of micro push rod with color camera for inspecting smaller 1-1/2″ to 3″ drain lines and many toilet traps. The 39″ probe rod lets you check hard-to-reach places, and three handy attachments help adjust viewing angles or retrieve objects. On-screen status indicators include date and time, SD card capacity and battery strength. The rechargeable battery powers the unit for up to four hours. “We take it everywhere,” Albright adds. Jake Albright stands behind his work and expects the same from the tools he uses. His customers in Florida appreciate that, and that’s why he’s built his drain cleaning arsenal around General equipment. For more information, call the Drain Brains® at General at 800-245-6200, or email info@drainbrain.com.